← Finish It Up Friday – Dinosaurs! I’m finally starting to see the other side of this cold. But I haven’t spent much time in the sewing room this week. However, I have gotten some hand sewing done on my Brinton Hall quilt. I’ve made most of this progress due to the recent discovery of the TV show, Doc Martin. It is a BBC TV series, available on Netflix. I’m not much of a TV watcher but I do like British TV. It is time for me to start preparing the hexies for the corners. I hope to dig through some scraps for that today. 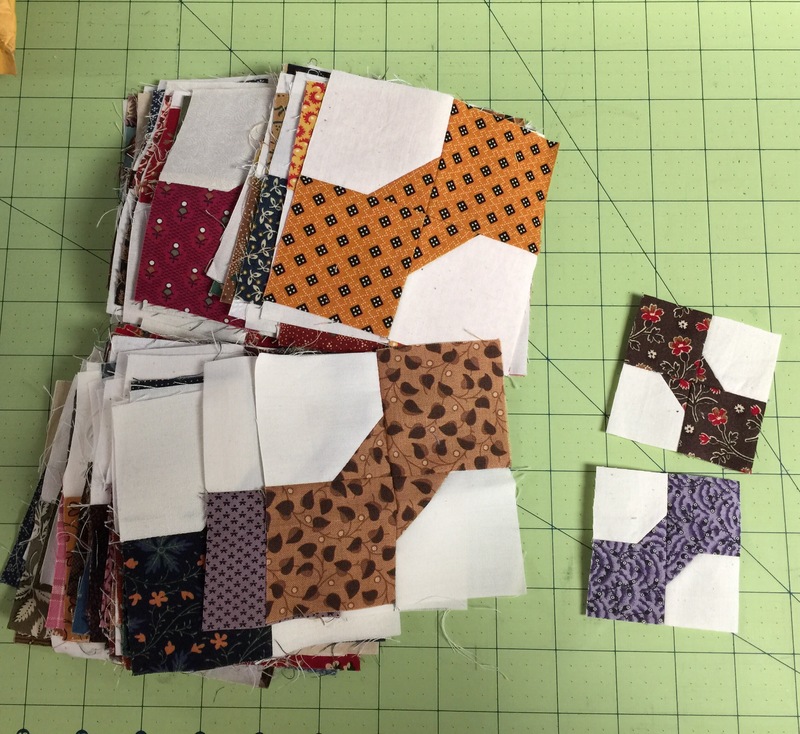 I received a big envelope of bow tie blocks yesterday from a swap hosted by Barb over at Fun with Barb. Aren’t they lovely? We woke up to much frost this mornin. The birdbath is now a bird skating rink. 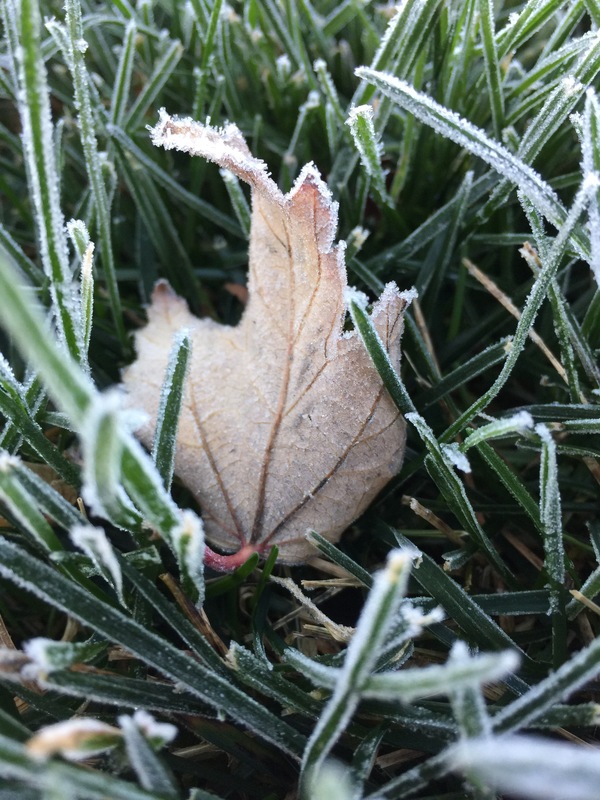 The frost on the grass is so pretty! Hope you are able to get some slow stitching in today. 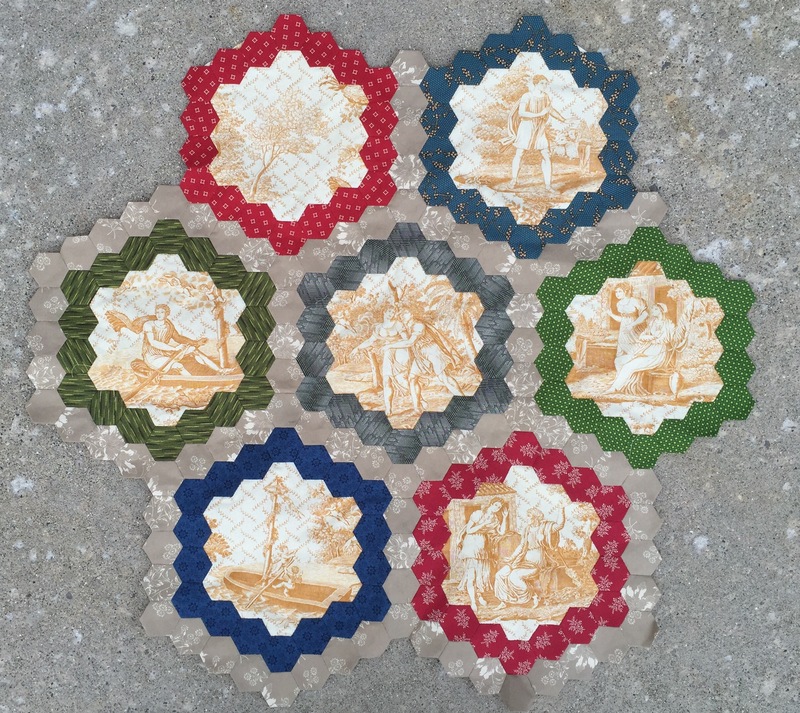 This entry was posted in Brinton Hall, Hand piecing, Hexagons. Bookmark the permalink. Hubby and I loved Doc Martin. Also the Canadian series: Heartland. We’re recuperating and have watche 3-4 episodes today. Your Brinton Hall hexies look nice. We had a touch of frost this morning too. Winter is on the way! It took three tries for me to like Doc Martin, but I do now. The scenery and music, plus the other characters helped me get past his mean disposition. Enjoy! Heavy frost here this morning too. Hope you are soon feeling back to your normal self. At least you got some stitching done! No frost here yet thankfully. Those bow ties are so pretty. What a nice swap. Your Brinton Hall quilt is growing niceley. It looks so elegant. I’ll have to check out that show. I’ve been doing the British baking show. 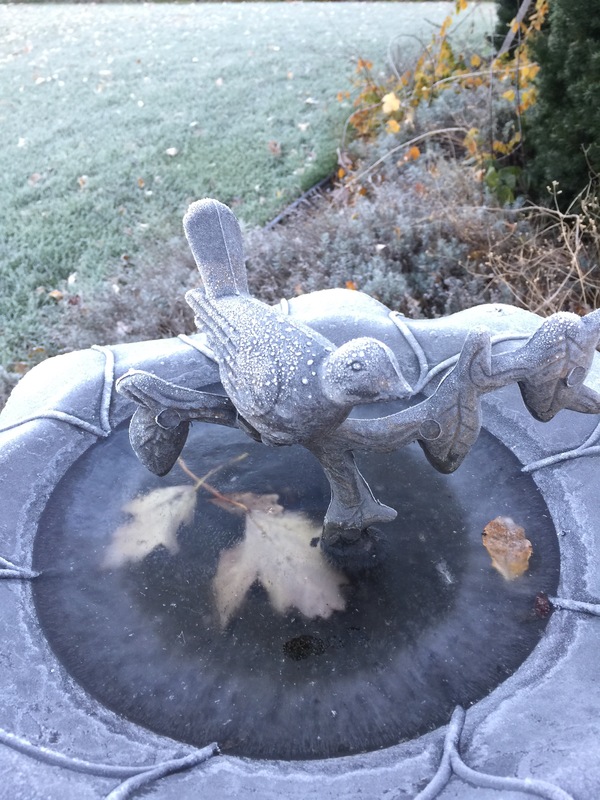 The poor birds with the bird bath – hope it warmed up to melt for them to drink. glad you’re feelling better. it’s getting a bit colder here, too. more time for sewing, I say! I like the BBC on Netflix, too. have you watched rosemary and thyme? or larkford to candlerise? I like midsommer murders, too. i’ll have to look up doc martin. Yes, Doc Martin is a grand show. After being off the air, it has been brought back to BBC. Our friends across the Pond may enjoy while we wait; unless you wish to purchase the DVDs that is. Enjoy feeling better! This is a reminder to me that it is time to take down my bird bath so ice doesn’t crack it. Hope you are felling better soon. Your quilt is looking fantastic! I love Doc Martin too… such a fun show with interesting characters. Glad you are feeling better…slow stitching is like taking medicine, so double up on that! Take it slow as those nasty bugs are always looking for the over-extended person to jump on. We had frost here, too, this morning. I’m glad that you were at least able to do a little hand stitching while you were feeling under the weather. Your Brinton Hall is looking fabulous … I can’t wait to see it grow. Love those bow tie blocks you received from the swap … are those two single ones to the right smaller than the swap blocks?